Who was the Mission named after? Mission San Juan Capistrano was named after an Italian saint. St. Giovanni da Capistrano (John of Capistrano in English) was born in 1386. Through most of his early adult years, he lived a secular life outside the church. He attended law school, and became a magistrate, and then a governor over Perugia in 1416. Only a few years after becoming governor war broke out in his land. He was assigned as an ambassador of peace to Malatesta, but when he arrived, they threw him in prison. While he spent time in prison, he began to think more about spiritual matters. Eventually, he decided to give up all material things, and surrender his life to serving God by joining the Franciscan Order. Upon taking the vows of service, John spent time learning theology and the art of preaching. After receiving his priesthood, he traveled all over Italy, Germany, Bohemia, Austria, Hungary, Poland, and Russia preaching forgiveness and penance. On his journeys, he preached to great crowds. It was said that when John entered a town to preach all business stopped. The people of the community dropped all that they were doing to hear him speak. Catholic administers also highly valued John’s passion and energy in reforming the church. He was sent all over Europe by the Pope and other important leaders to continue positive changes. While in Frankfurt, Germany in 1454, he was asked to give advice about the crusade against the Turks. Not only did he provided insight into the upcoming battle, he joined it! John accompanied the famous Hunyady throughout the campaign: he was present at the battle of Belgrade, and led the left wing of the Christian army against the Turks. Soon after battling the Turks, John caught the deadly bubonic plague and died on October 23, 1456. John was beatified in 1694, and canonized as a saint in 1724. When do the Swallows come back to San Juan Capistrano? Mission San Juan Capistrano is known worldwide for the Cliff Swallows return each year. Father John O’Sullivan started the legend and celebration of the Cliff Swallows in the early 20th century. Cliff Swallows migrate from South America to North America in the spring and summer for breeding. Although San Juan’s legend claims these migrating birds return promptly on March 19th it is silly to assume this true. Cliff Swallows are wild animals and migrate according to weather patterns; therefore, do not always return the exact day each year. As you will see on the map, Cliff Swallows do frequent Southern California, and therefore San Juan Capistrano. For more information about Cliff Swallows, see the fact sheet below. If you want more information about the Legend of the Cliff Swallows, and why Mission San Juan Capistrano celebrates their return on March 19th please see the next question. Summer breeding season extends from western and central Alaska eastward to Nova Scotia, southward to southern Mexico, central Arkansas, northern Georgia, and New Jersey. Winters range is in southern South America. Cliff Swallows breeds in many different types of habitats. They are usually found in areas with open foraging and cliffs or buildings for nesting. Cliff Swallows avoid heavy forest, desert, or high mountains areas. Female Cliff Swallows lay 1-6 eggs that are creamy white with speckling. Each parent incubates the egg fro about 14- 16 days. The young birds fly when 21 to 24 days old. Each mating pair can have two broods a year. Swallows nest look like covered bowls made of mud pellets. Each nest has a small entrance tunnel on one side. Swallows line their nest with grass. Nests are placed on cliffs or a vertical wall (usually just under an overhang). Nests are usually in colonies. The biggest colony reported had 3700 swallows. Each mating pair builds the nest which takes anywhere from 5-14 days. What is the Legend of Mission San Juan Capistrano’s Cliff Swallows? The legend of Mission San Juan Capistrano’s Cliff Swallows began in the 1920s by “The Great Restorer”, Father John O’Sullivan. His story fascinated many, and even inspired writer and composer Leon Rene, to write the famous 1930s tune, When the Swallows Come Back to Capistrano. Every year, Mission San Juan Capistrano honors and remembers Father O’Sullivan’s legendary story by celebrating Swallows Day on March 19th (interesting to note, March 19th is St. Joseph’s Day, and Father O’Sullivans Birthday). “One day several years ago,” He said (Father O’Sullvian), “I was passing the new hotel at the west side of the town plaza, and there was the proprietor out with a long pole smashing the swallows’ nest that were under the eaves. The poor birds were in a terrible panic, darting hither and thither flying and screaming about their demolished homes. “What in the world are you doing,” I asked. “But where can they go?” I continued. “Sure enough they all took me at my word, and the very next morning they were busy building under the newly built sacristy of Father Serra’s church. By the way, there is rather odd fact about these swallows. You know they migrate every autumn, but there return is with the greatest regularity on Saint Joseph’s day, the nineteenth of March. How old is the Mission? Mission San Juan Capistrano was founded on November 1, 1776. It will celebrate 242 years on November 1, 2018! Who owns Mission San Juan Capistrano? The Mission was returned to the Catholic Church in 1865 by Abraham Lincoln. The property is owned by the Diocese of Orange, however, the Mission operates under a separate non-profit IRS 501 (c) (3) and is not financially supported by the Catholic Church, nor the state or federal government. What number is Mission San Juan Capistrano of the 21 Missions? Mission San Juan Capistrano is the 7th of the 21 California Missions. How big is the Mission? The Mission is about 10 acres including the Basilica and the Parish School. Why is the Great Stone Church in Ruins? The Great Stone Church’s monumental construction began in 1797. The people of Mission San Juan Capistrano desperately needed a new church. The small adobe chapel they had been using for over ten years could not hold all of the Native Americans that lived at the Mission. A new church had to be constructed. Everyone in the Mission community wanted to be apart of this historic project, especially women and children. Although they could not gather two hundred pound blocks, they made a difference by doing the little things like gathering small stones, and gravel for the mortar which held the blocks together. Over the next nine years, the entire Mission community both young and old, both men and women, built the Great Stone Church. For nine years, they toiled, and in 1806, they finished the Church and had a grand party to celebrate. Tragically, only six years after they completed the church something terrible happened. On December 8, 1812, people arrived for the early morning mass. During the service, a great quake shook the earth. The bell tower swayed and collapsed on the center of the church blocking escape for all that were inside. Forty people scrambled trying to exit, but blocks of stone fell upon them. Forty people were buried alive. After the disaster, the padres made no attempt at rebuilding, therefore leaving it in ruins for the entire community to remember their loss. Why is Mission San Juan Capistrano called the “Jewel” of the Missions? Mission San Juan Capistrano received the nickname the “Jewel” of the Missions because of the Great Stone Church. Upon its completion in 1806 (9 years of construction), it was considered a modern marvel, an architectural gem. No other church compared in size or beauty on the West Coast of California. 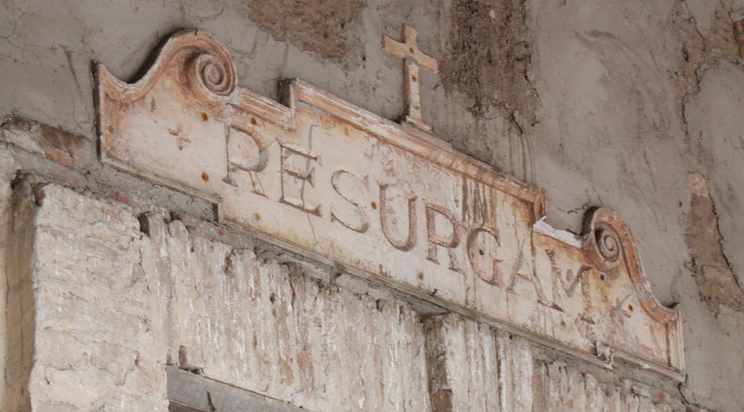 Although the church did not survive the earthquake of 1812, it is still inspirational in its ruins. How many bells does Mission San Juan Capistrano have? Four bells hang on the bell-wall, or Campanario. The two largest bells hanging within the Campanario are replicas. Today, the original two largest bells are hanging where they would have stood within the bell tower of the Great Stone Church. The two smaller bells hanging in the Campanario are original. Each Bell has a special inscription with a date of casting. A year later, when Father Serra came to establish Mission San Juan Capistrano on November 1, 1776, the bells were either no where to be found, recast, or taken to another Mission. The mystery still lingers. Many townsfolk of San Juan Capistrano believe the bells are still underneath the earth waiting for someone to discover them. How did Spanish bring water into the Mission? Padres and soldiers of Mission San Juan Capistrano designed and oversaw the construction of long channels called aqueducts, or zanjas. These zanjas brought water into the Mission for drinking, cooking, field irrigation, laundry, and bathing. Due to the warm Mediterranean climate of California, little rain fell during the year, which meant water had to be found at its source, the nearby creeks and rivers. Mission San Juan Capistrano relied heavily upon three: Horno Creek, Trabuco Creek, and San Juan Creek for all their fresh water needs. According to maps and archaeological findings, Mission workers dammed mountain streams and rivers, built storage reservoirs, which fed water into the Mission zanjas. Most zanjas were lined with stone or brick. Often the zanjas had special gates which could stop and start the flow of water. Archaeologists have uncovered many sections of the zanjas within the mission grounds, which can still be viewed today.